With the Middle East being as contentious as it is now and the fact that the only state in the region that has nuclear weapons also happens to be the one that is most hated and refuses to sign arms agreements (Israel), a different approach is needed. I argue that Iran, the state Israel is so deeply afraid of, should acquire nuclear weapons and be the regional counterbalance. For the past 30 some odd years, the Islamic Republic of Iran has been cast in the international community as the big, bad, Boogeyman that wants to "wipe Israel off the map" (note: this is a misquotation, but that will be later) and kill all the Jews in a second Holocaust. Iran has been accused of trying to develop nuclear weapons secretly countless times and each time a more dire endgame is speculated. However, it one takes the time to shed the misinformation and propaganda surrounding Iran, one can tell that Iran isn't actually the Boogeyman they are made out to be and that Iran with a bomb wouldn't actually be so bad. But before we discuss Iran with a bomb, it's time to dispel some current myths about Iran now without a bomb. Does Iran want to "wipe Israel off the map"? Our dear Imam (referring to Ayatollah Khomeini) said that the occupying regime must be wiped off the map and this was a very wise statement. We cannot compromise over the issue of Palestine. Is it possible to create a new front in the heart of an old front. This would be a defeat and whoever accepts the legitimacy of this regime has in fact, signed the defeat of the Islamic world. Our dear Imam targeted the heart of the world oppressor in his struggle, meaning the occupying regime. I have no doubt that the new wave that has started in Palestine, and we witness it in the Islamic world too, will eliminate this disgraceful stain from the Islamic world (New York Times). The only issue is...that's a mistranslation. Arash Norouzi, the co-founder of the Mossadegh Project, argues that the quotation in question is directed at the Israeli regime (as opposed to the people) and, when translated correctly, uses the phrase "vanish from the page of time" (very similar to Leon Trotsky's metaphorical "ash heap of history") (Naiman and Weisbrot). Imam (Khomeini) ghoft (said) een (this) rezhim-e (regime) ishghalgar-e (occupying) qods (Jerusalem) bayad (must) az safheh-ye ruzgar (from page of time) mahv shavad (vanish from) (Norouzi). If you have the time, I suggest you read Norouzi's full article here. [Ahmadinejad] made an analogy to Khomeini’s determination and success in getting rid of the Shah’s government, which Khomeini had said “must go” (az bain bayad berad). Then Ahmadinejad defined Zionism not as an Arabi-Israeli national struggle but as a Western plot to divide the world of Islam with Israel as the pivot of this plan. Again, Ariel Sharon erased the occupation regime over Gaza from the page of time (Cole). So does Iran want to "wipe Israel off the map"? No. Case closed. Is Iran anti-US and anti-Israel? Yes. There's not much to say here except "yes". Iran doesn't like Israel...at all. And Iran doesn't like the US...at all. (But with good reason might I add because we did overthrow their democratically elected leader and installed a dictator in his place who killed tons of people and then made them out to be the bad guys. But that's just a small hiccup, right?) Then again, who cares if they don't like us? So, does Iran have a nuclear weapons program? Short answer: I don't know. Long answer: I don't know. Probably not though. Do I care if there were clandestine programs in the past? Not particularly since I think a nuclear Iran is a good thing; but regardless, here are the facts that we have thus far. We continue to assess Iran is keeping open the option to develop nuclear weapons in part by developing various nuclear capabilities that better position it to produce such weapons, should it choose to do so. We do not know, however, if Iran will eventually decide to build nuclear weapons. […] We continue to judge Iran's nuclear decisionmaking is guided by a cost-benefit approach, which offers the international community opportunities to influence Tehran (Clapper). But what about currently? Well amid the current nuclear talks, Iran's Foreign Minister, Javad Zarif, has stated that there would be no point for Iran to develop nuclear weapons secretly right now as that would derail talks (Agence France-Presse). What's more, in addition to Khamenei's fatwa against nuclear weapons, president Rouhani has said “[w]e are not after weapons of mass destruction. That’s our red line." saying that his anti-nuclear stance is a matter of principle (The Guardian). So what does that leave us with? 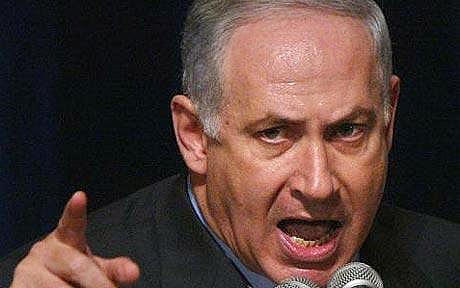 One pissed off Netanyahu and the unanswered question of why I think Iran should get the bomb. A year ago, back when I supported the Global Zero movement, if one would have said "Peter, in a year you're going to be advocating nuclear proliferation" I would have laughed and then said "no". But here we are, a year later, and I think nuclear weapons serve a very important role in deterring a great power war and should be acquired by regional hegemons, Iran included. To understand why, however, one must first understand the basis of deterrence theory. In the past, when I've explained deterrence to novice debaters, I've used the following example which I still think is good: you have two men and a loaf of bread. One man is armed with a rock, the other with pistol, and both want the bread. The man with the rock realizes that it makes no sense for him to grab the bread by himself because he is out-gunned. Conversely, the man with the pistol realizes that the other man isn't a threat because he has the bigger stick; the pistol. This mutual unspoken understanding/fear creates a stalemate where the landscape can then be shaped by the man with the gun while deterring aggression caused by the man with the rock. Expanding this to states with armies, smaller forces seldom engage larger forces in symmetric war because they realize they are out-gunned and will lose (this doesn't always apply *cue Soviet Russia* but it's the general thesis of deterrence theory and realpolitik). At the end of the day leaders are rational, and those who aren't are ousted, and won't engage in conflicts they don't think they can win. Basically, the bigger the stick, the less likely you are to be messed with. The next logical question, following the introduction of deterrence theory, is how has it played out in the nuclear era? Tepperman further argues that since states are rational and leaders tend to prefer not having their armies and cities destroyed in war, they restrain themselves when they know the cost. Due to the insane advances in thermonuclear technology, second-strike technology, advanced warning, and fail-deadly technology, the costs of a hypothetical nuclear attack are obvious and calculable. In conventional warfare, each side doesn't know what weapons the other will use and thus it is harder to make effective decision calculus based on estimated loses and so miscalculation occurs...in nuclear warfare that is not the case. In a nuclear war scenario there are really only a few different weapons a state could use and each one has a calculable impact which, as Tepperman indicates, have made "the costs of war obvious, inevitable, and unacceptable" (Tepperman). To put it bluntly, "when both sides have the ability to turn the other to ashes with the push of a button—and everybody knows it—the basic math shifts" and "[t]he iron logic of deterrence and mutually assured destruction is so compelling, it's led to what's known as the nuclear peace: the virtually unprecedented stretch since the end of World War II in which all the world's major powers have avoided coming to blows" (Tepperman). As the WOPR in the 1983 film Wargames concluded (probably to the dismay of Herman Kahn, assuming he saw it in his last few months) in reference to a thermonuclear war scenario: "[t]he only winning move is not to play" (x). All of the above is fine and, for the most part, generally accepted when it comes to stable powers, but what about the proliferation of nuclear weapons among unstable states? What about India and Pakistan? The record since then shows the same pattern repeating: nuclear-armed enemies slide toward war, then pull back, always for the same reasons. The best recent example is India and Pakistan, which fought three bloody wars after independence before acquiring their own nukes in 1998. Getting their hands on weapons of mass destruction didn't do anything to lessen their animosity. But it did dramatically mellow their behavior. Since acquiring atomic weapons, the two sides have never fought another war, despite severe provocations (like Pakistani-based terrorist attacks on India in 2001 and 2008). They have skirmished once. But during that flare-up, in Kashmir in 1999, both countries were careful to keep the fighting limited and to avoid threatening the other's vital interests. Sumit Ganguly, an Indiana University professor and coauthor of the forthcoming India, Pakistan, and the Bomb, has found that on both sides, officials' thinking was strikingly similar to that of the Russians and Americans in 1962. The prospect of war brought Delhi and Islamabad face to face with a nuclear holocaust, and leaders in each country did what they had to do to avoid it (Tepperman). What's more, the proliferation of nuclear weapons not only slows arms races between countries due to the technology needed to build a bomb, but encourages restraint and stronger centralized leadership. As a state gains nuclear technology, they don't want a bomb falling into the wrong hands and receiving universal international backlash so the state develops safeguards as well as a stronger civil-military relationship and centralization to secure their nuclear facilities (Waltz). A final claim made by nuclear alarmists is that once one country gets the bomb, it will spark "wildfire proliferation". This idea, however, is flawed for numerous reasons. First is that it ignores that not all states want nuclear weapons and that some will decide they'd rather invest money elsewhere, as was the case with South Africa when they became the world's first former nuclear state. Second is that it ignores the fact that over the past six decades there have been, at most, 12 nuclear states at a time, and 9 of which persist today (Tepperman). Despite the nuclear weapons in 9 different countries ranging from France to India, there has not been "wildfire proliferation", if anything there has been a decline in nuclear states. And third, it ignores security pacts and nuclear umbrellas which serve to deter smaller states from getting nuclear weapons because they realize they are under the protection of a larger nuclear state (eg. South Korea and Japan) (Alagappa). And finally, we arrive at the big question: why should Iran acquire nuclear weapons? The answer to this question, details below, is twofold. First, Israel cannot be trusted to be the regional hegemon (especially the nuclear hegemon) in the Middle East, and second, Iran is best able to deter Israeli aggression and expansion given their history and lack of pro-US security agreements, for example. First: Israel, for any new readers, isn't my favorite country in the world, and when it comes to nuclear security they are the bottom of the barrel. Not only has Israel refused to sign the non-proliferation treaty (a treaty that Iran has signed), but they have been caught with their hand in the nuclear cookie jar by trying to clandestinely sell nuclear secrets to apartheid (pre-nuclear) South Africa and China (McGreal) (The Insider). What's more, Israel, unlike Iran, refuses to allow IAEA inspections and auditing of their weapons because of their policy of "nuclear ambiguity" (Glaser) (video). And of course, this is ignoring the uranium Israel stole from the US. But ignoring all of that, do I really need to cite the countless human rights abuses that Israel has engaged in with impunity? At the end of the day, Israel is a danger to the stability of the Middle East, if not the whole world, and a nuclear armed Israel allows for unchecked aggressive actions. Second: Iran is a very unique country in that it doesn't have explicit security ties with the US or other Western countries, it stands in stark contrast to the US backed Saudi regime and acts as a counter balance, and it is willing to directly oppose Israel and their actions (not to mention the fact that Iran hasn't started a war in over 200 years). If Iran goes nuclear, Israel and Iran will deter each other, as nuclear powers always have. There has never been a full-scale war between two nuclear-armed states. Once Iran crosses the nuclear threshold, deterrence will apply, even if the Iranian arsenal is relatively small. No other country in the region will have an incentive to acquire its own nuclear capability, and the current crisis will finally dissipate, leading to a Middle East that is more stable than it is today (Waltz). What's more, a nuclear Iran would have affects far beyond the Middle East. A nuclear Iran could help promote oil stability between the Middle East and China due to stronger control of the Straight of Hormuz and it could ease tensions between Israel and Saudi Arabia. Additionally, a nuclear Iran would be a geopolitical game changer in that Iran would no longer need to potentially rely on Hezbollah or other undesirable measures (what Waltz refers to as 'nuclear asymmetry') for regional deterrence which would, in turn, cripple Hezbollah's fighting ability and create a more stable region (Romulous) (Waltz). At the end of the day, in contrast to the cries by Netanyahu and his ilk to "bomb Iran", I say the following: Give Peace a Change - Arm Iran. Agence France-Presse. "Israel military chief: Iran not pursuing nuclear weapon." Israel military chief: Iran not pursuing nuclear weapon. N.p., 25 Mar. 2012. Web. 17 July 2014. <http://www.rawstory.com/rs/2012/04/25/israel-military-chief-iran-not-pursuing-nuclear-weapon/>. -----Agence France-Presse. "Iran FM sees no benefit in building nuclear weapon - Channel NewsAsia." Channel NewsAsia. N.p., 13 July 2014. Web. 17 July 2014. <http://www.channelnewsasia.com/news/world/iran-fm-sees-no-benefit/1258354.html>. Al-Jazeera. "Dan Meridor: We misquoted Ahmadinejad." Talk to Al Jazeera. Al-Jazeera, 16 Mar. 2012. Web. 17 July 2014. <http://www.aljazeera.com/programmes/talktojazeera/2012/04/2012413151613293582.html>. Alagappa, Muthiah . The Long Shadow Nuclear Weapons and Security in 21st Century Asia. x: Stanford, 2008. Print. Clapper, James. "Unclassified Statement for the Record on the Worldwide Threat Assessment of the U.S. Intelligence Community for the Senate Select Committee on Intelligence." Intelligence.Sentate.Gov. N.p., 31 Jan. 2012. Web. 17 July 2014. <http://www.intelligence.senate.gov/120131/clapper.pdf>. Cole, Juan. "Hitchens Hacker And Hitchens." Informed Comment. Juan Cole, 3 May 2006. Web. 17 July 2014. <http://www.juancole.com/2006/05/hitchens-hacker-and-hitchens.html>. Dehghan, Saeed. "Israeli military chief: Iran will not decide to make nuclear weapons." theguardian.com. Guardian News and Media, 25 Apr. 2012. Web. 17 July 2014. <http://www.theguardian.com/world/iran-blog/2012/apr/25/israel-benny-gantz-iran-unlikely-develop-nuclear-weapons>. Glaser, John. "Israel Rejects UN Call to Open Nuke Program to Inspections." News From Antiwar.com. N.p., 5 Dec. 2012. Web. 24 July 2014. <http://news.antiwar.com/2012/12/05/israel-rejects-un-call-to-open-nuke-program-to-inspections/>. McGreal, Chris. "Revealed: how Israel offered to sell South Africa nuclear weapons." The Guardian. Guardian News and Media, 24 May 2010. Web. 24 July 2014. <http://www.theguardian.com/world/2010/may/23/israel-south-africa-nuclear-weapons>. Naiman, Robert, and Mark Weisbrot. "Arash Norouzi Explains the "Wiped Off the Map" Controversy - What Iran's President Never Said." The Huffington Post. TheHuffingtonPost.com, 19 Jan. 2007. Web. 17 July 2014. <http://www.huffingtonpost.com/mark-weisbrot-and-robert-naiman/arash-norouzi-explains-th_b_39069.html>. New York Times. "Text of Mahmoud Ahmadinejad's Speech." New York Times. N.p., 30 Oct. 2005. Web. 17 July 2014. <http://www.nytimes.com/2005/10/30/weekinreview/30iran.html?ex=1161230400&en=26f07fc5b7543417&ei=5070>. Norouzi, Arash. ""WIPED OFF THE MAP" - The Rumor of the Century by Arash Norouzi." The Mossadegh Project. The Mossadegh Project, 18 Jan. 2007. Web. 17 July 2014. <http://www.mohammadmossadegh.com/news/rumor-of-the-century/>. Romulous, Aetius. "The benefits of a nuclear Iran." Asia Times Online :: Middle East News, Iraq, Iran current affairs. N.p., 18 Nov. 2009. Web. 24 July 2014. <http://www.atimes.com/atimes/Middle_East/KK18Ak01.html>. Tepperman, Jonathan. "How Nuclear Weapons Can Keep You Safe." News Week. N.p., 28 Aug. 2009. Web. 24 July 2014. <http://www.newsweek.com/how-nuclear-weapons-can-keep-you-safe-78907>. The Guardian. "Rouhani says Iran will not acquire nuclear weapons 'on principle'." theguardian.com. Guardian News and Media, 1 Mar. 2014. Web. 17 July 2014. <http://www.theguardian.com/world/2014/mar/01/rouhani-iran-nuclear-weapons-principle>. The Insider. "Israel secretly sells American nuclear weapons to China." The Insider. N.p., n.d. Web. 24 July 2014. <http://www.theinsider.org/news/article.asp?id=776>. Waltz, Kenneth. "Why Iran Should Get the Bomb." Foreign Affairs. Council on Foreign Relations, n.d. Web. 24 July 2014. <http://www.foreignaffairs.com/articles/137731/kenneth-n-waltz/why-iran-should-get-the-bomb>.